Cook County IL is NOT Seattle! I am sure you have heard of a misguided proposal that comes from Seattle City Council President Tim Burgess about imposing a $25 per gun and $0.05 per round of ammunition additional sales tax in Seattle. If not, you can read all about it here. The tax is supposed to generate money that would be used for violence prevention programs. One example that Mr. Burgess keeps touting as a proof that the tax will work is Cook County, IL, where a very similar tax have been generating $800,000 per year. This is why he claims that Seattle's "estimate" of $300,000-$500,000 is feasible, and we in the gun industry who are in command of the actual numbers are just a bunch of cry babies. So let's look at the Cook County, IL. Cook County is a home to 5.2 million people, and occupies 945 square miles of land. 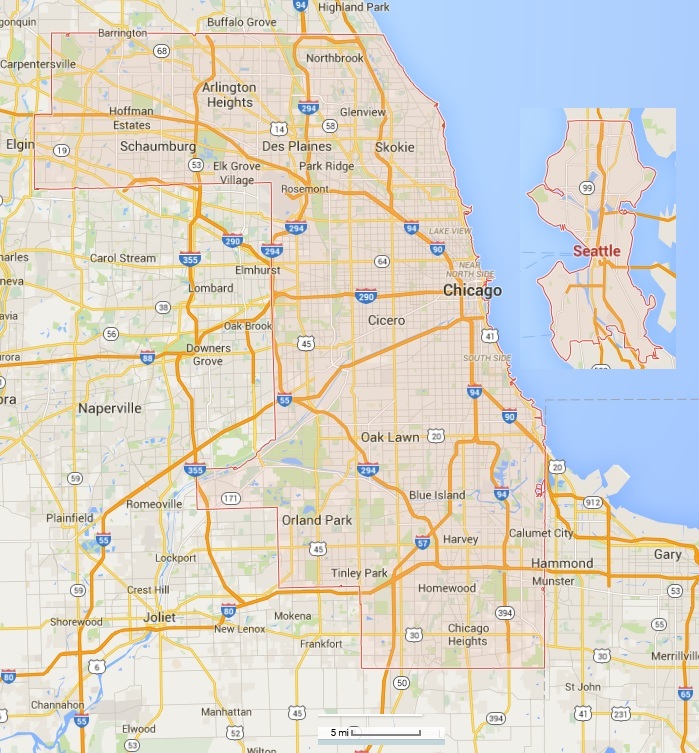 It consists primarily of Chicago and Chicago's suburbs. The City of Seattle has a population of 0.6 million people, and occupies 84 square miles of land. The whole of Seattle would basically fit inside Chicago's downtown. Yet Tim Burgess expects Seattle - which is ten time smaller - to generate only half of the Cook County's revenue. This would only be possible if Seattleites were to buy five times more firearms and ammunition than the residents of Chicago, per person. Personally, I would love for this to be the case, but it does not sound very likely! If you simply scale the projection by population, the maximum that Seattle could hope for would be $80,000. But it gets worse, of course. Wherever you are in Seattle, you are never further away than 7 miles from a gun store just outside the city limits - and typically, more than two or three of them. You have to go for 18 miles to get from Chicago downtown to the nearest cluster of gun shops right outside the county border. So it's much easier for someone in Seattle to buy firearms elsewhere, whereas the population of Chicago is more or less captive. Even though, here is the list of gun stores in Cook County. As you can see, majority of the gun stores in Cook County have ranges, so they sell ammunition - at inflated prices - to the shooters at the range. This is, again, a captive audience, which has to tolerate the price increases. How many shooting ranges are there in Seattle? Ah, yes - zero. So unlike Cook County, there will be NO money generated by this misguided legislation in Seattle. All firearms transactions will simply move out of the City (Precise Shooter in particular have been scouting for properties just north of 145th Street), and Seattle will lose what little revenue it now gets from the sales tax - I would estimate it at $50000-$60000. So if Tim Burgess really and truly cares about the gun violence victims, he should be looking for a plan B, because his current plan is a pure fantasy.